Relaxed and rustic in style, this unique dining room table set provides an up-to-date spot for meals in your home. The table features a mixed material design with a table top constructed of border framed select mindi veneers in a rustic brown finish and turned tubular metal legs in aged brown color. Braced leg supports add charm to the table's look. For seating, the upholstered side chairs present a sophisticated look with graphite fabric chairs at the head of the table, and linen woven fabric chairs at the sides. 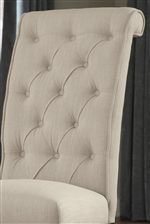 Each chair features a button tufted back, and an elegant roll back design at the top of the backrest. 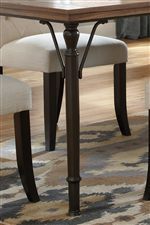 Wood saber legs in a dark finish anchor the chairs' versatile style. The Tripton 7-Piece Rectangular Dining Room Table Set w/ Wood Top & Metal Legs by Signature Design by Ashley at AHFA in the area. Product availability may vary. Contact us for the most current availability on this product. Case Construction Tubular metal legs on table and server. Select mindi veneers in medium rustic brown color on table top and server. Transitional with a casual rustic twist, the Tripton dining room collection updates your dining room or kitchen with a stylish appeal. Metal turned legs with braced corners in an aged brown finish contrast nicely with the mindi veneers in medium rustic brown color on the table top and server. Tufted side chairs in a woven fabric color add elegance when used with the table. These pieces will feel right at home in any decor, from farmhouse to eclectic contemporary. The Tripton collection is a great option if you are looking for Transitional furniture in the area. Browse other items in the Tripton collection from AHFA in the area.